Zillow, Trulia and realtor.com are rocking the real estate world. Inman plans to keep you up to speed on these giants in a weekly feature, “Portal watch,” that explains what they are doing for you and against you, and how they are duking it out with each other. “We are going to take this opportunity (of Move’s acquisition by News Corp.) to prove that we can be the industry’s very best online real estate partner,” said Greg Schwartz, chief revenue officer at Zillow, when news first broke that News Corp. and Move intended to merge. News Corp.’s acquisition of realtor.com operator Move Inc. closed this week, officially folding realtor.com into Rupert Murdoch’s global media empire and ending Move’s 15-year run as a publicly traded company. We also learned that Zillow and Trulia’s pending merger will probably not happen in 2014. 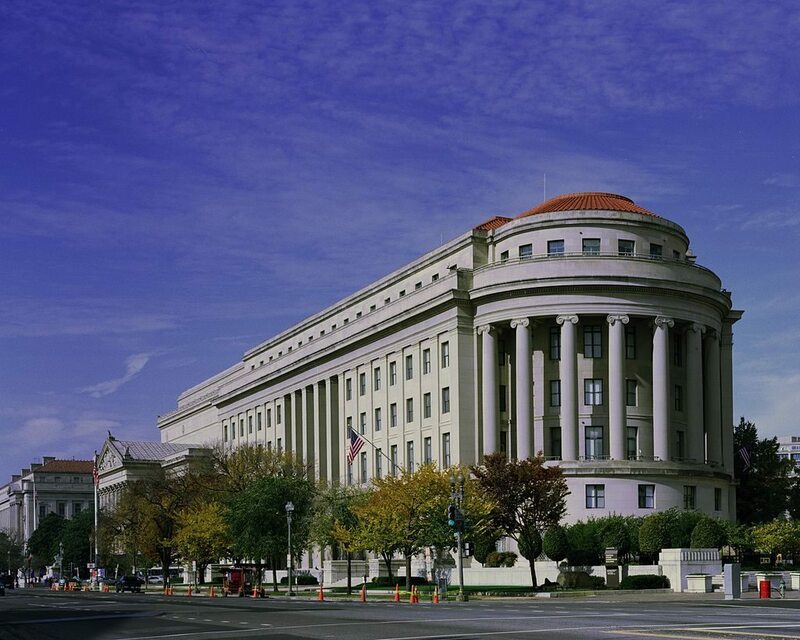 Zillow has agreed not to consummate the deal until at least Feb. 1, which gives the FTC some breathing room to complete its antitrust review. How does it look from one of the perches of the real estate world? 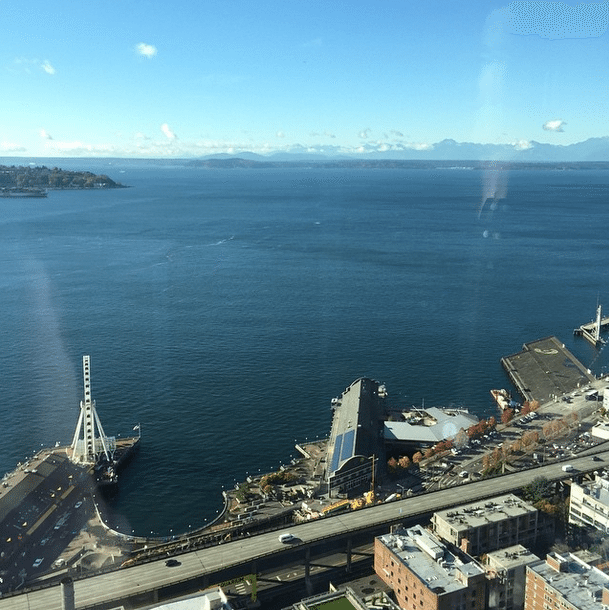 Zillow CEO Spencer Rascoff posted this photo of the view from his Seattle office to Instagram on Monday. Last Friday, Move teased some images for the new designs of realtor.com’s desktop and mobile site in a regulatory filing. Sample realtor.com listing detail page mobile design that Move teased on Friday. 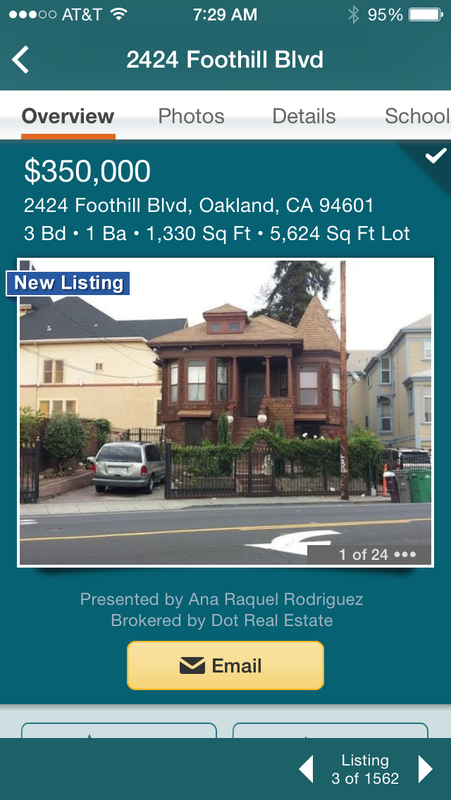 See the current mobile design of a listing detail page as it shows up on realtor.com’s iPhone app here. 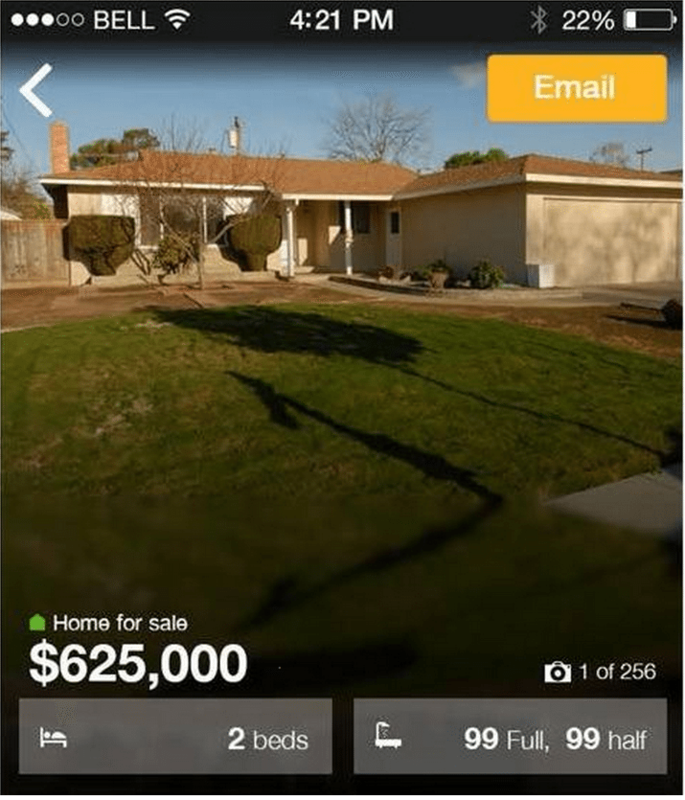 The new layout on mobile and Web feature image-centric designs that fill the screen, bringing realtor.com closer to the formats of Zillow and Trulia’s current displays. 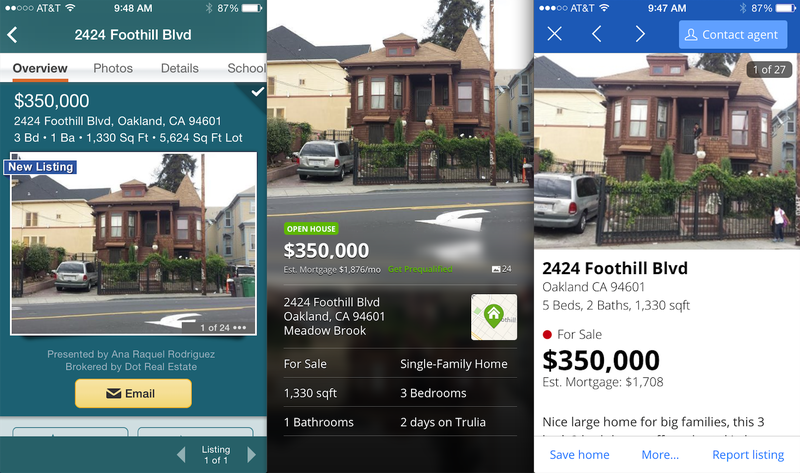 Comparison of how the same listing currently displays on realtor.com, Trulia and Zillow’s respective iPhone mobile apps. Combined, Zillow, Trulia and realtor.com accounted for more than two-thirds of all visits to real estate sites from desktop computers in October. Zillow and Trulia each lost Web market share in terms of traffic from desktop computers between September to October while realtor.com gained. But since all three get the majority of their visitors from mobile devices, these desktop trends are a bit less significant than they were in the past. 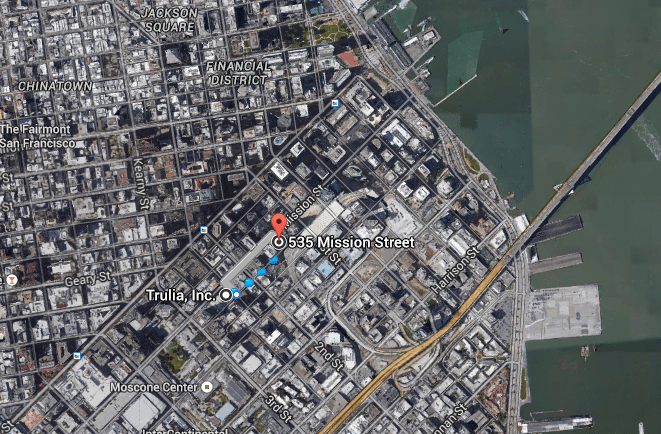 This week, Trulia moved its headquarters a few blocks to 535 Mission St., a brand-new building in downtown San Francisco’s SOMA district. Video of the building that houses Trulia’s new headquarters in downtown San Francisco. Trulia is the anchor tenant. Trulia’s new headquarters is a four-minute walk from its previous office space. Trulia is an anchor tenant for the new building and originally signed the nine-year lease for 52,595 square feet of new office space in March, but added 26,620 square feet in late July just before news of its acquisition by Zillow dropped, Trulia revealed in its third-quarter financial statement filed with the SEC. The additional space will be ready in October 2015 (Zillow has said it will keep the Trulia website and brand alive). Trulia also has the option to lease approximately 40,000 more square feet if things continue to go well for the firm. Trulia does expect things to go well. Zillow and Trulia filed an amended registration statement related to their pending merger on Monday. In it, management at the respective firms estimated their future revenue and profits as stand-alone companies. Trulia management expect the firm’s revenue will grow 278 percent to $1.04 billion in 2019 from the $270 million it expects to report this year. Over that period adjusted earnings before interest, taxes, depreciation and amortization (EBITDA) are projected to grow by 1,113 percent to $352 million. For that to happen, Trulia would have to expand EBITDA margins from 12 percent today to 35 percent in 2019. EBITDA is one metric financial analysts use to measure the operating profit (or loss) of a firm. Source: S-4 registration statement by Zebra Holdco Inc., the holding company formed to accommodate the potential Zillow-Trulia company. Zillow also has a bullish outlook for its future. 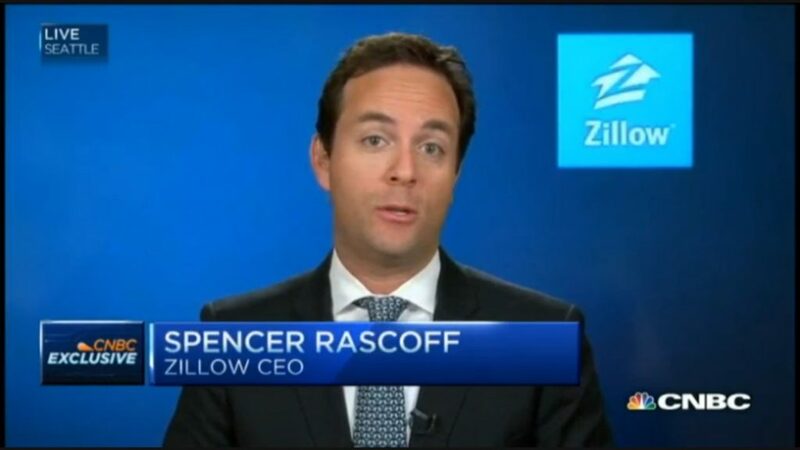 Zillow sees revenue growing 383 percent in the next five years (to $1.58 billion in 2019). During that period, adjusted earnings are projected to grow nearly twice as fast — by 656 percent (to $559 million). Put another way, EBITDA margin is projected to go from 16 percent today to 35 percent in 2019. Unlike Zillow and Trulia, Move laid out three possible revenue and adjusted earnings forecasts that vary depending on factors like how successful Move is in penetrating the rentals market, improving the revenue it generates per listing, and agent uptake of its software-as-a-service tools. For this article, we’re taking the midpoint of Move’s forecast. Move management expects revenue to grow 79 percent from 2014 to $454 million in 2019. In that time, Move forecasts that it will almost double its profit margin from 11 percent in 2014 to 20 percent in 2019. Source: Two Move SEC filings, one dated Oct. 15, another dated Nov. 10. Note: Some Zillow, Trulia and Move execs are on programs to automatically sell stock they own each month at predetermined times. 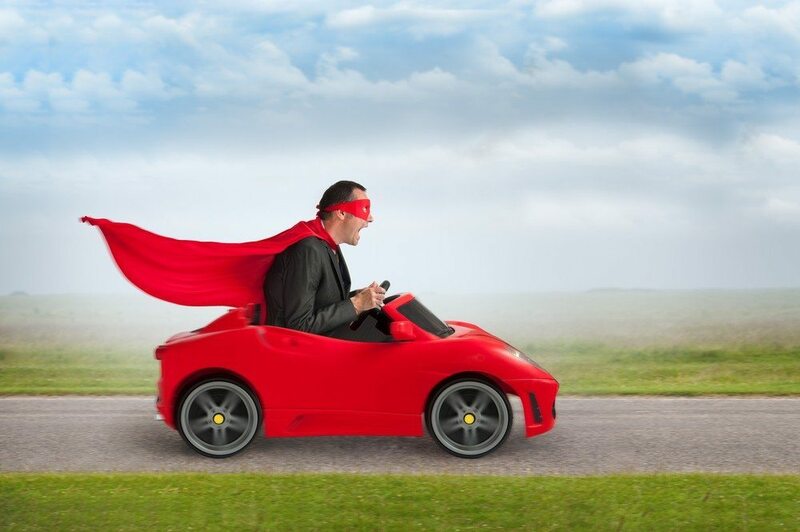 Stock sales do not necessarily reflect a lack in confidence by execs in their respective firms. 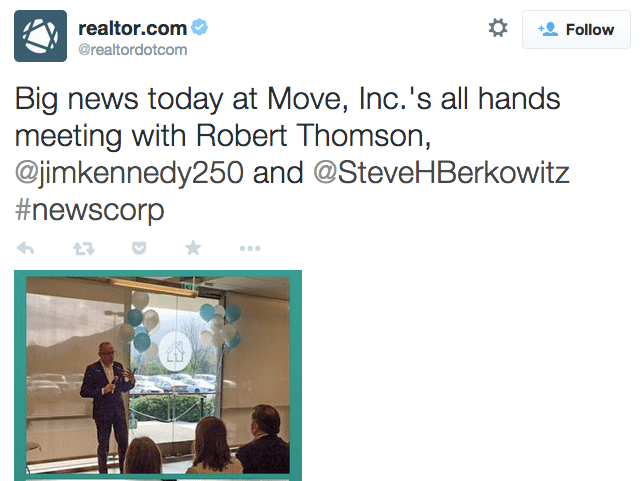 News Corp. CEO Robert Thomson addressed the new News Corp. troops at a Move all-hands meeting on Friday, captured in a tweet posted from realtor.com’s Twitter account. Source: Google Finance *As of market close on Friday, Nov. 14, 2014. **Move stock information is through Thursday. News Corp. closed its acquisition of Move at midnight Eastern time on Thursday, which coincided with Move’s end as a publicly traded company. Zillow, Trulia and realtor.com are all hiring for a broad range of positions, but primarily they’re looking for engineers. Of the 91 job openings Zillow had on Friday, 51 were for engineers and developers. At least one position looks like it’s designed to help Zillow integrate Trulia’s listing database with its own, if and when the merger closes. A call for tech pros similarly dominated Move and Trulia’s job boards. Of the 56 open positions at Move, 26 were for engineers. Engineers made up 14 of Trulia’s 35 openings. Trulia launched a $50,000 sweepstakes in May in conjunction with its second TV ad of the year to help drive downloads of its mobile app. This week, Trulia and lender Veterans United teamed up to give Air Force vet Ashley Rivera, who entered the sweepstakes but didn’t win, $50,000 in honor of Veterans Day.